Looking at the weather forecast for 23 May 2015 indications were for blue skies all the way. It's just a shame the weather has its own ideas as the day dawned cold, cloudy and grey. 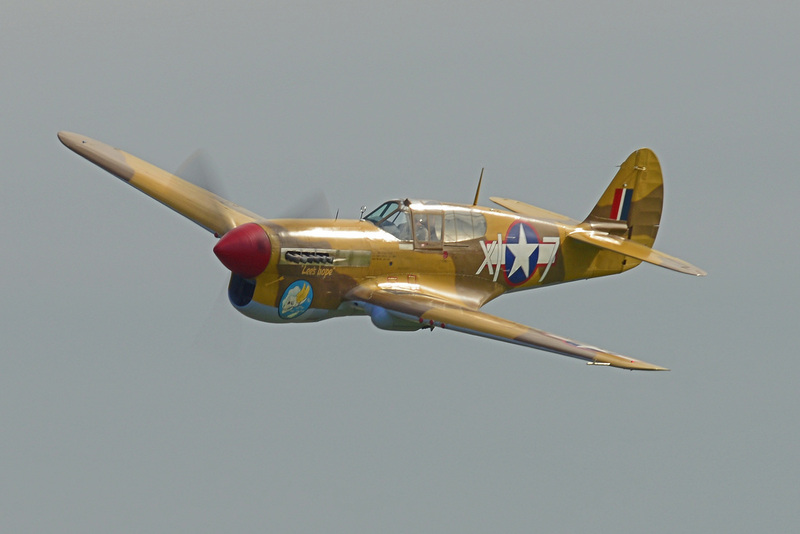 The climate stayed that way for most of the airshow but it did brighten a little towards the end of flying. On the 8th May 1945 the war in Europe ended with the surrender of the German Armed Forces. The end of hostilities led to scenes of great jubilation on the streets around the world with one million people celebrating in London alone. Among those enjoying the end of the war in Europe were King George IV, Queen Elizabeth and Winston Churchill who appeared to the crowds on the balcony of Buckingham Palace. 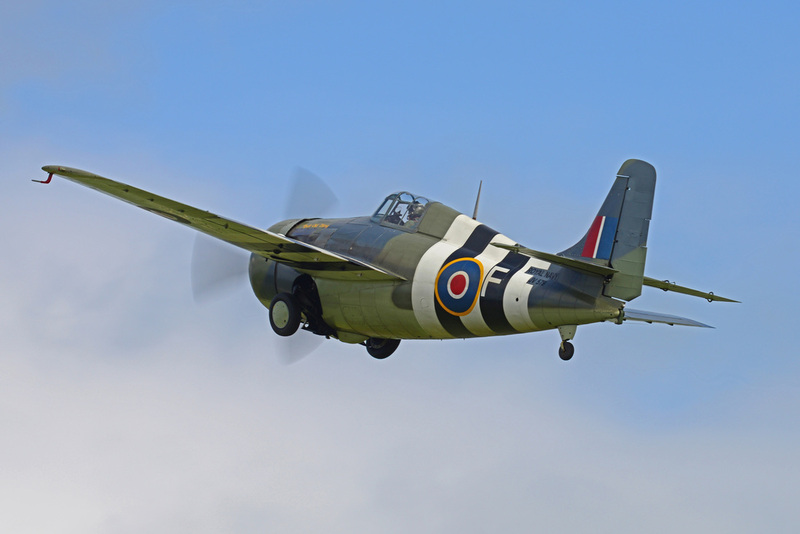 To commemorate the event the Imperial War Museum Duxford staged the VE Day Anniversary Air Show over the weekend of 23 & 24 May 2015. ​The following report is from the 23 May 2015. 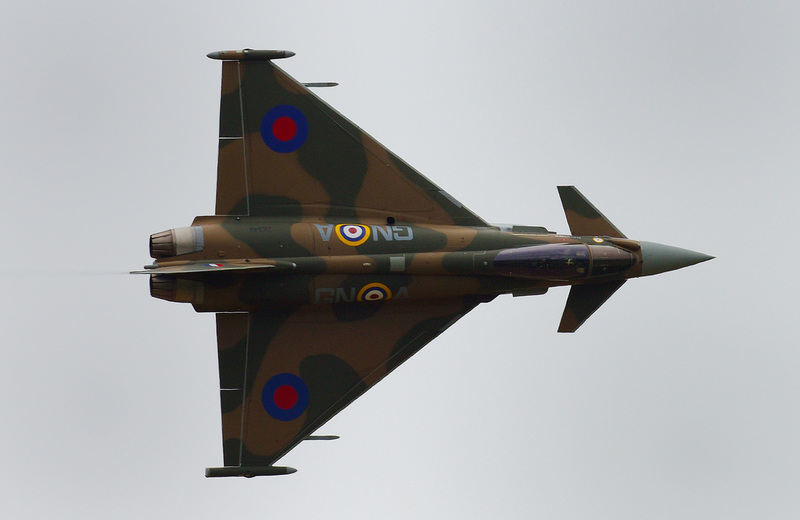 With commentary from Aeroplane's Editor Ben Dunnell the day's events opened with a display by No 29 (R) Squadron's Eurofighter Typhoon FGR.4A ZK349. The Typhoon flying from RAF Coningsby has been repainted in the scheme of Hawker Hurricane P3576 of No 249 Squadron that was flown by Flight Lieutenant J.B. Nicholson. On 16 August 1940 Red Section of No 249 Squadron was being led by Nicholson from Boscombe Down. In combat with Ju88's and Bf110's, Nicholson won Fighter Command's only Victoria Cross awarded during World War Two. With his Hurricane already in flames from being hit by gunfire from a Bf110, Nicholson was trying to bail out of the stricken aircraft when he saw another Bf110 cross his gunsight. Nicholson stayed in the Hurricane and kept pressing the firing button until the Bf110 was hit and dived away to destruction. Only then did he bail out but his ordeal did not end there, for on his descent he was fired at by members of the Home Guard. 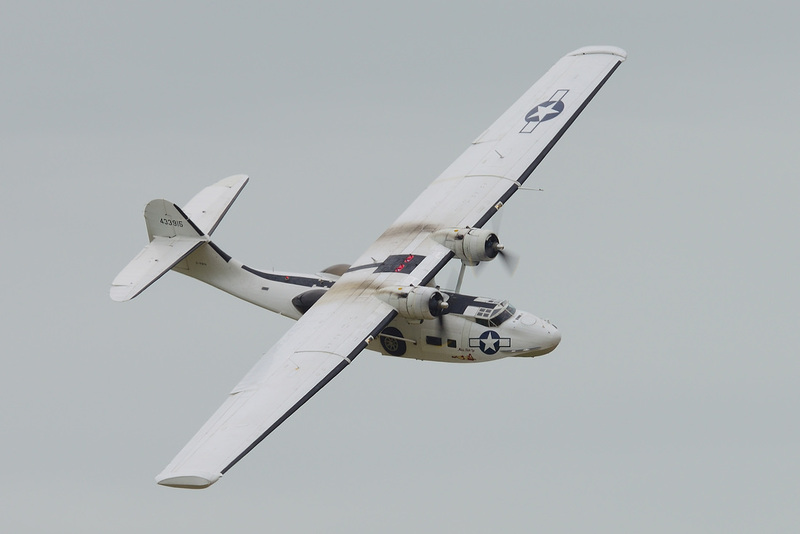 With the departure into the gloom of the Typhoon, next to display was Plane Sailing's Consolidated PBY-5A Catalina. 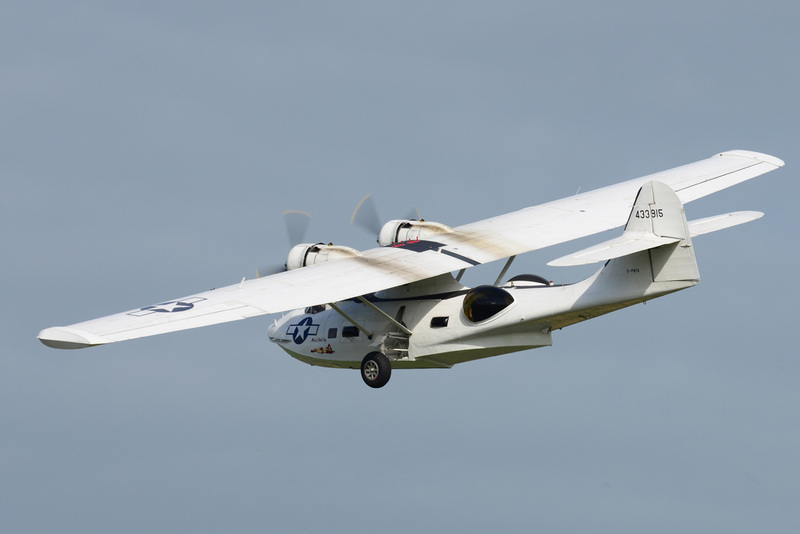 Used throughout the war the Catalina was an aircraft that could take on a variety of roles which included anti-submarine warfare, search and rescue, reconnaissance and convoy protection. Among the claims to fame for the Catalina was the initial spotting of the German battleship Bismark which was being hunted by the Royal Navy following the destruction of HMS Hood. This sighting led to the eventual pursuit and sinking of the German battleship. The seeds to the Second World War were sown at the end of the First with the signing of the Treaty Of Versailles. The humiliation of the Germans under the treaty led to the rise of Adolf Hitler and the Third Reich. 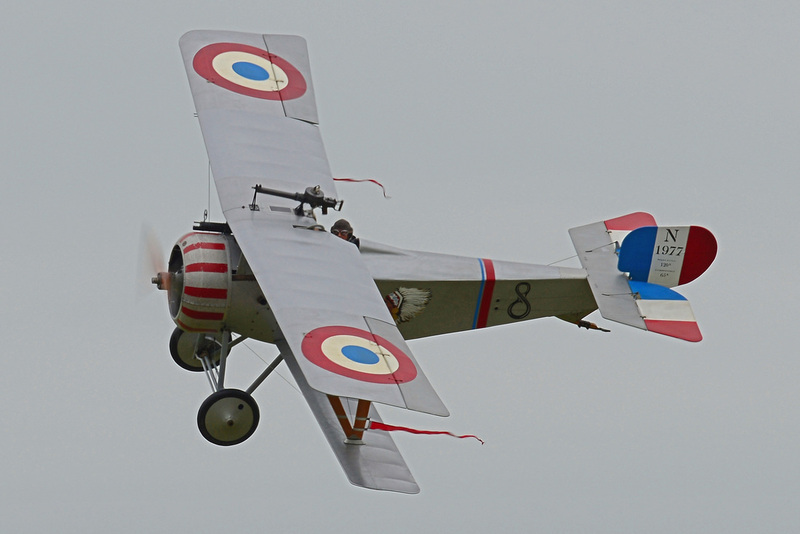 Air warfare during the First World War saw great strides in aircraft technology, tactics and armaments. It also saw the rise of a number of future players in the Second World War such as Herman Goring & Arthur (Bomber) Harris. 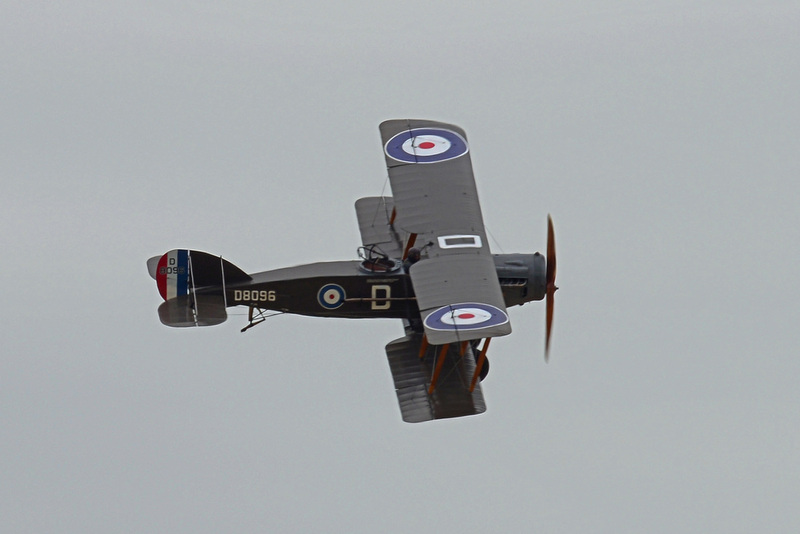 This part of the airshow saw the Shuttleworth Collection's Bristol F2B Fighter, Bob Gauld-Gallier's Nieuport 17 Replica & the WW1 Aviation Heritage Trust's Royal Aircraft Factory BE2e take to the skies to give a flavour of Great War flying. Following WW1 the world had had enough of war and a period of calm prevailed which led many nations into a false sense of security. Aircraft became available to those with money on the civilian register. 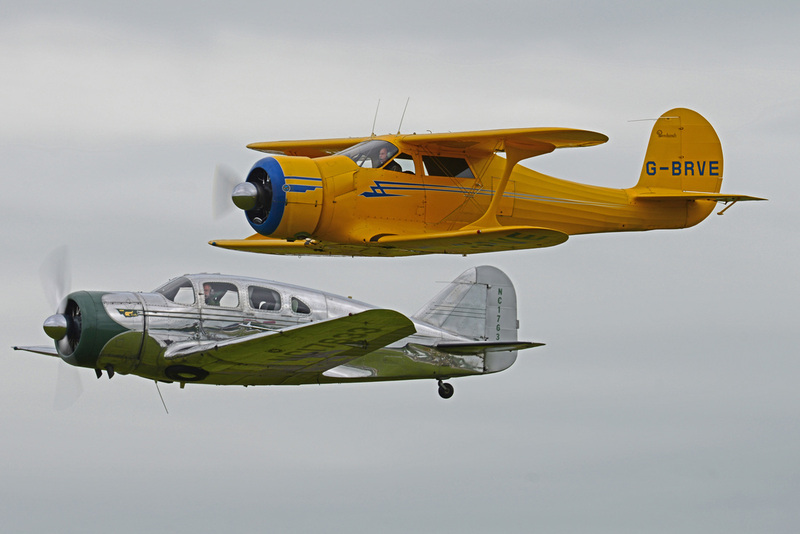 These included aircraft such as Nigel Pickard's Spartan Executive 7W N17633 and The Fighter Collection's Beech D17S Staggerwing G-BRVE. 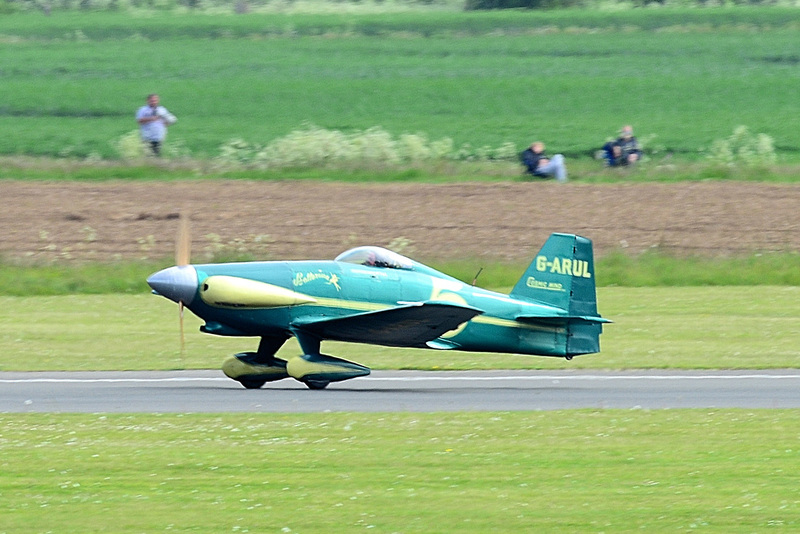 The emerging air racing scene brought designs like the very tricky Gee Bee and Richard Seeley's Travel Air Type R Mystery Ship G-TATR (below). As war clouds once again gathered over Europe during the 1930s the RAF found that its aircraft designs were somewhat lacking. 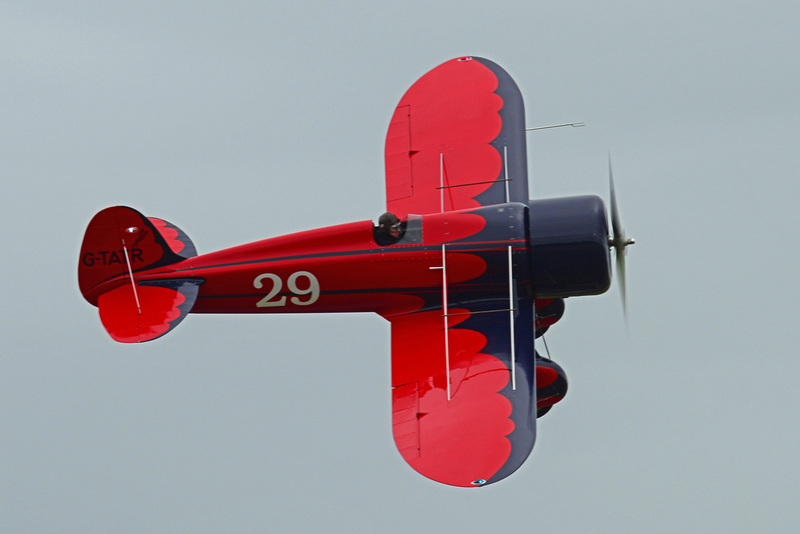 Many fighter squadrons were still equipped with biplanes and contemporary bomber designs began to outclass them in terms of speed. 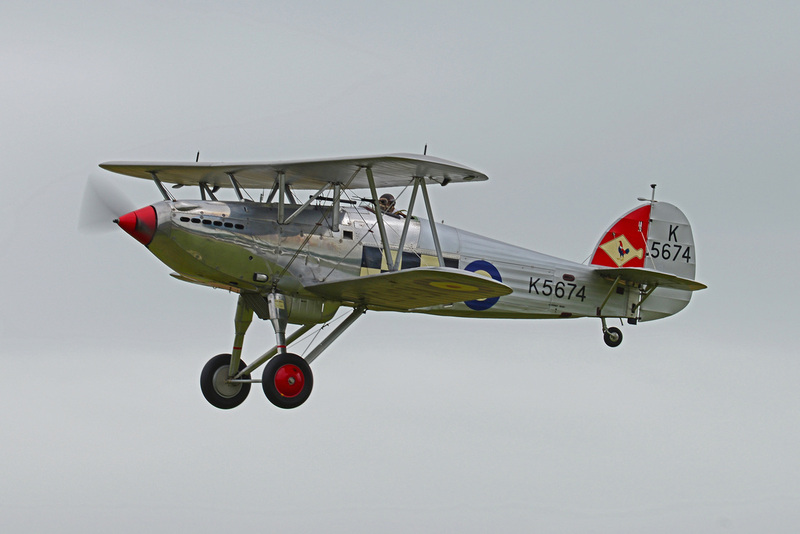 Although first class fighters, the RAF's Gloster Gladiator and Hawker Fury would struggle against the new breed of fast monoplane fighters such as the Luftwaffe's Messerschmitt Bf109 that were starting to come into production and service. 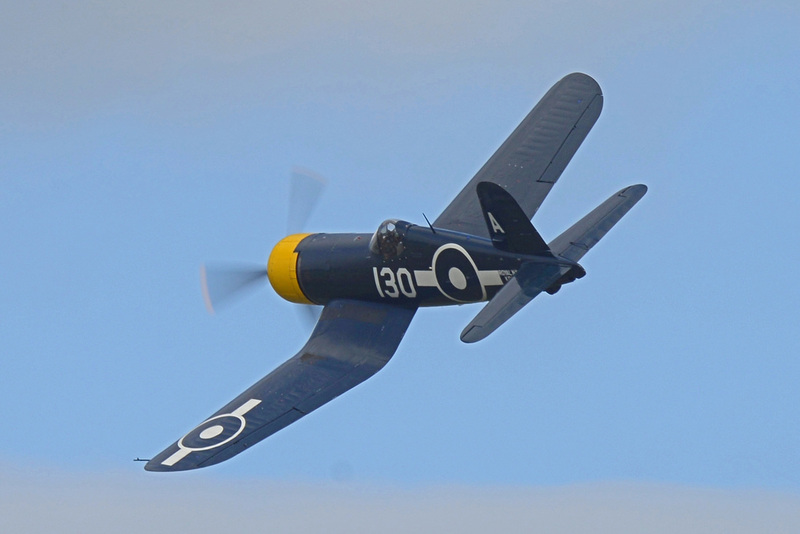 Making its public display appearance, The Historic Aircraft Collection's Hawker Fury Mk I K5674 flew in the hands of master warbird pilot Charlie Brown. 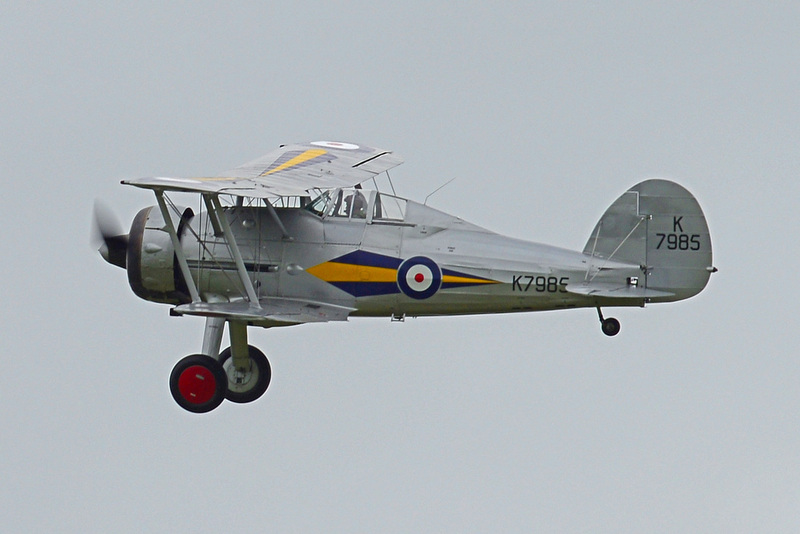 The Fury was partnered with Shuttleworth's Gloster Gladiator K7985 to showcase the years when biplane fighters were the mainstay of the RAF's fighter squadrons. In May 1940 the relative calm of the Phoney War, which had been prevailing since the start of the hostilities in September 1939, was shattered as the German's launched an attack into France and the Low Countries. The tactics of Blitzkrieg (Lightning War) were used which left the defending armies outclassed and reeling from the onslaught. The RAF tried to stem the tide of the advancing German Army by throwing into the defence Bristol Blenheim and Fairy Battle light bombers. These aircraft were decimated by the roving Luftwaffe Bf109 fighters and flak as they attacked bridges and troops. There was great acts of heroism from the light bomber crews as the defending armies were pushed back to the Channel Coast at Dunkirk. Although much maligned by troops on the beaches, who assumed that RAF Spitfires and Hurricanes were not defending them against the constant attacks by Stuka dive bombers, the RAF fighters were in constant action against the Luftwaffe as they tried to defend the soldiers on the ground. 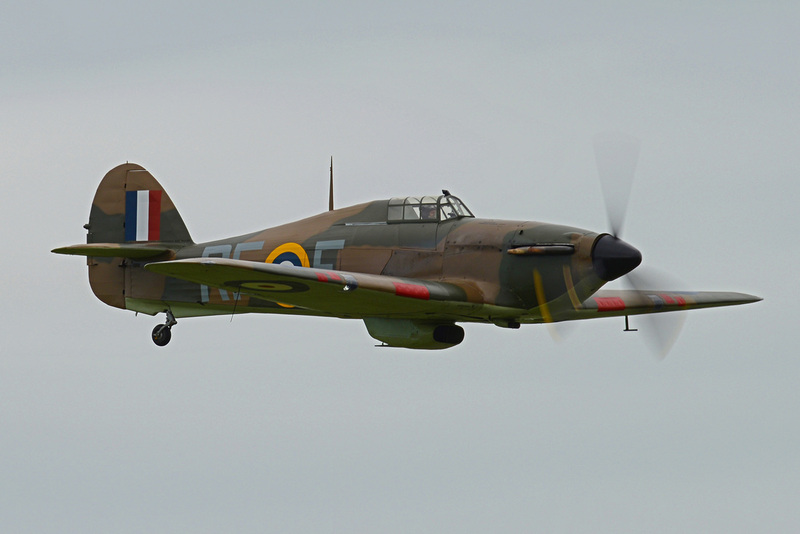 A display by the Historic Aircraft Restoration Company's Hawker Hurricane XIIa P3700 (Z5148) showed an aircraft in the colours that would have been prevailing at the time of the Battle Of France. This year's VE Day Anniversary Airshow saw the first public display of The Aircraft Restoration Company's Bristol Blenheim Mk.I L6739 G-BPIV. 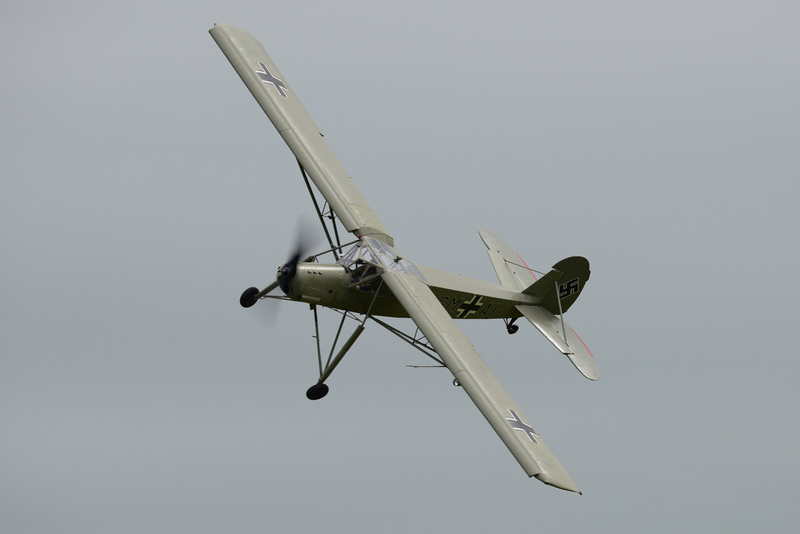 The aircraft has been subject to a major rebuild having sustained damage in a landing accident at Duxford in August 2003. The aircraft is fitted out to represent a nightfighter but is a truly fitting memorial to the bomber crews who sacrificed so much in 1940 to try and halt the German advance. Following the attack on Pearl Harbour in December 1941, America entered the war. Along with the RAF's Bomber Command, the USAAF 8th Air Force embarked on a strategic bombing offensive. By day and night the 8th Air Force and Bomber Command slowly contributed to the dismantling of Germany's ability to wage war but collectively lost over 70,000 aircrew. Displaying during this part of the show was Boeing B-17G Flying Fortress Sally B operated by B-17 Preservation Ltd. This part of the show saw displays by a number of aircraft that took part in the war in a number of different theatres. 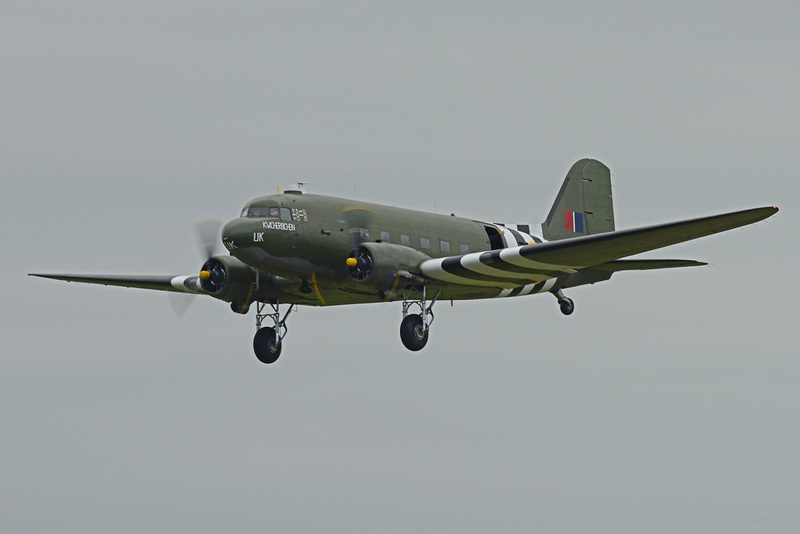 Transport aircraft which were the workhorses tasked with delivering men and material to the front line were represented by the Battle Of Britain Memorial Flight's Douglas Dakota MKIII ZA947. 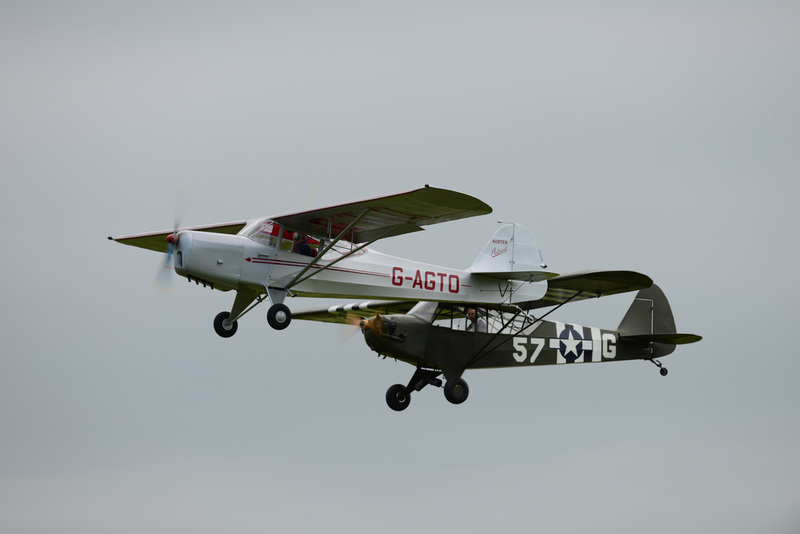 An important element of warfare is that flown by spotting and liaison aircraft which were suitably remembered in displays undertaken by FrazerBlades Piper L-4 Cub, D&M Miller's Auster 5J1 Autocrat and P Holloway's Fieseler Storch. The flying continued with an aircraft that will shortly become a memory. 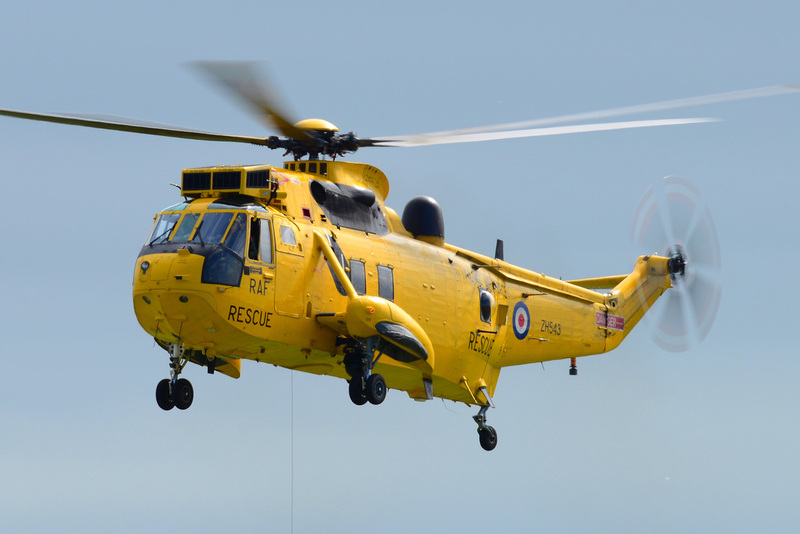 RAF and Royal Navy Sea King helicopters have for many years provided Search & Rescue (SAR) on both sea and land. The SAR Squadrons provide 24 hour cover and 15 minute readiness during daylight hours and 45 minutes at night. 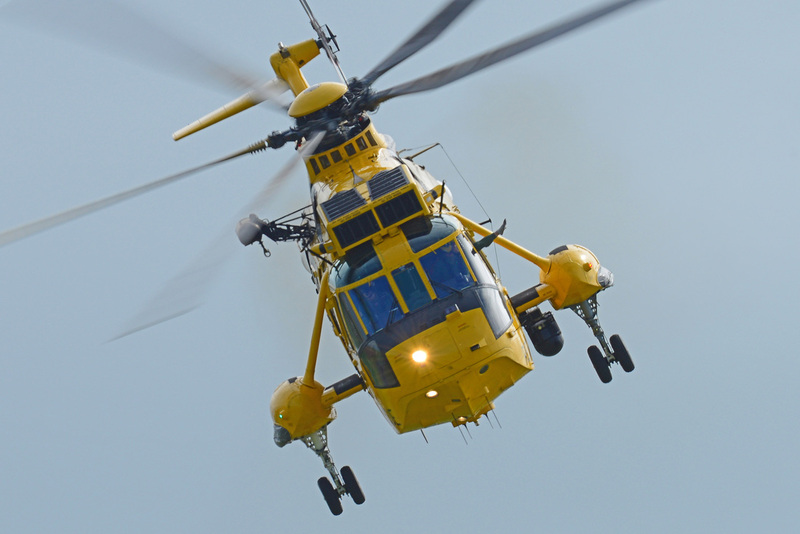 The service will in the very near future be privatised, which will see an end to the familiar yellow and red/grey helicopters currently operated by the military. Displaying at Duxford this afternoon was Sea King HAS.3A ZH543 of B Flight No 22 Squadron Wattisham. The routine included a simulated rescue using the helicopter's winchman. A change of pace heralded the arrival of the Red Bull Matador display team. 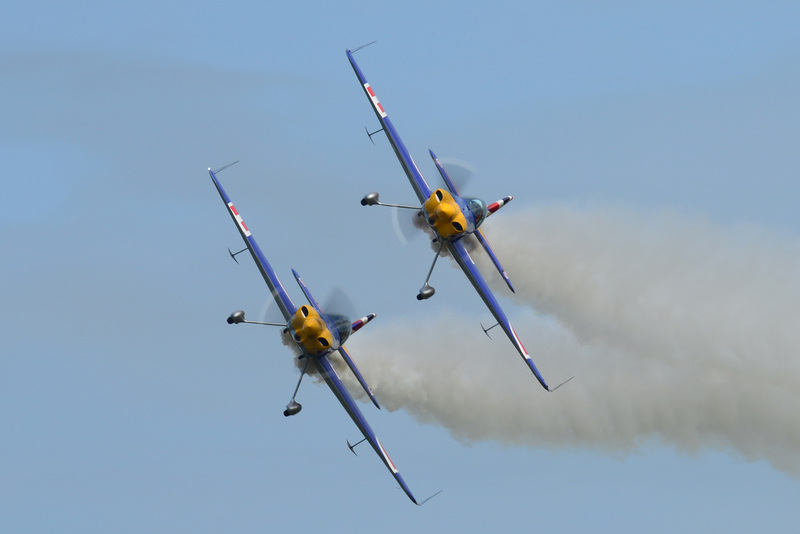 The team is led by Paul Bonhomme with Steve Jones as his wingman and use two high performance XtremeAir Sbach XA341 aircraft. Powered by a 315 hp Lycoming engine, the XA341 has an astonishing 450 degree per second roll rate. As the war in Eurpoe neared its end jet aircraft began to appear in the skies. First to appear was the Messerschmitt Me 262 for the Luftwaffe followed by the Gloster Meteor with the RAF. The 262 and Meteor never met in combat but the Messerschmitt saw action against allied bombers and piston engined fighters. Meteors flying with No 616 Squadron were used to intercept V1 flying bombs and did deploy to Belgium early in 1945. 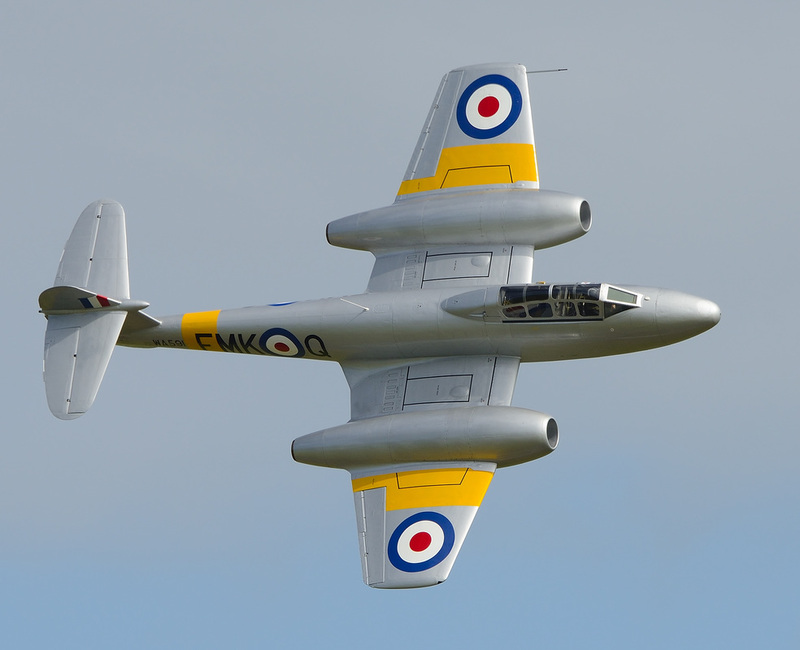 Displaying at Duxford was Meteor T.7 WA591 which flew in the hands of Jon Corley from Classic Air Force. 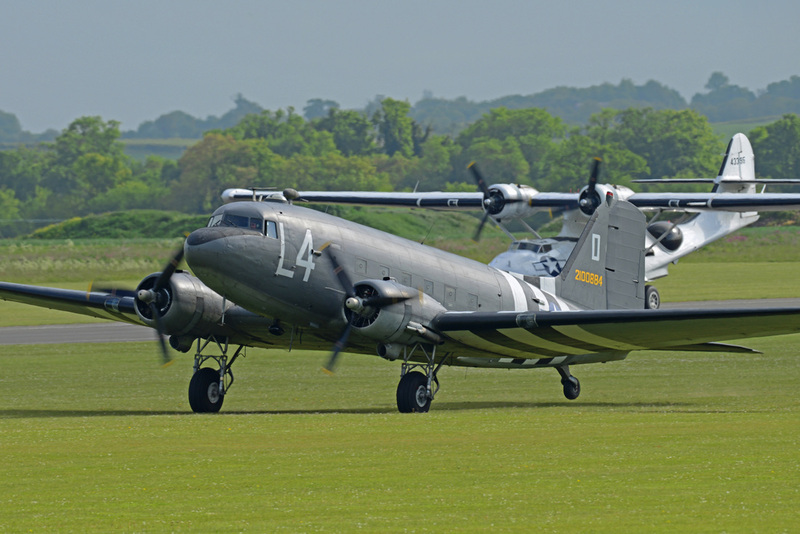 The aircraft's striking silver colour scheme was beautifully offset by Duxford's now blue skies. 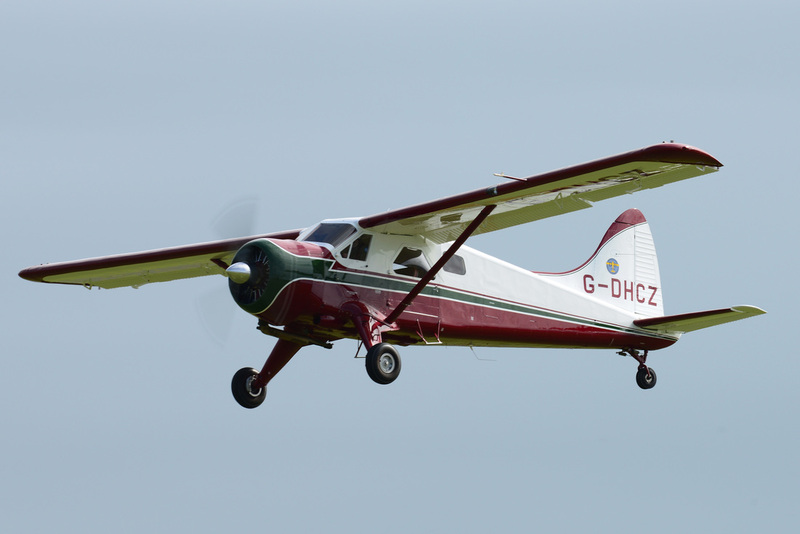 Following the Meteor was the Aircraft Restoration Company's de Havilland Canada DHC-2 Beaver G-DHCZ and Peter Kynsey/Alan Walker's LeVier Cosmic Wind G-ARUL. This display showed two very different aircraft types to very good effect. This section showed two aircraft display which were the unsung workhorses of the Second World War. 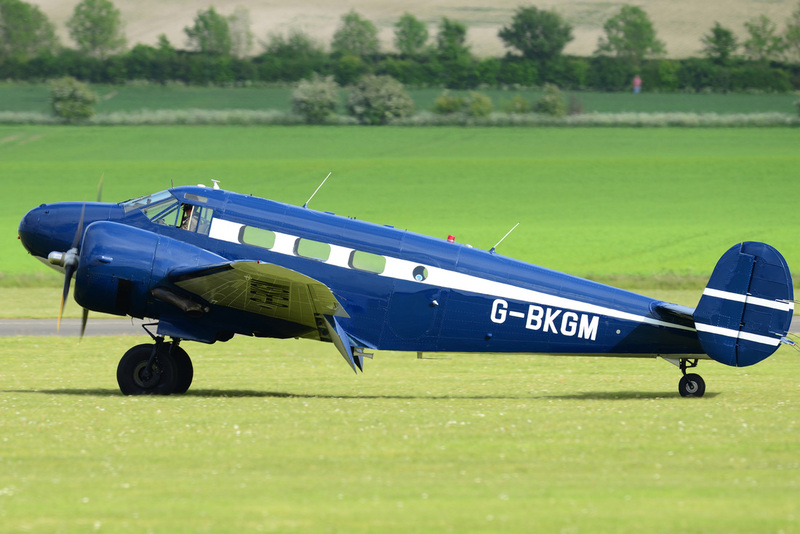 The Avro Anson was used for a variety of roles which included navigation training, anti-submarine warfare, reconnaissance and air gunnery practice. 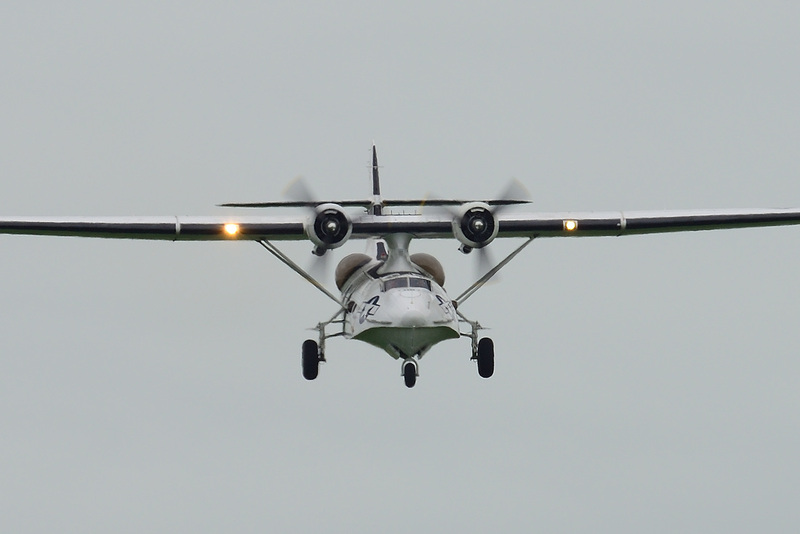 The example in the display was flown by Air Atlantique. 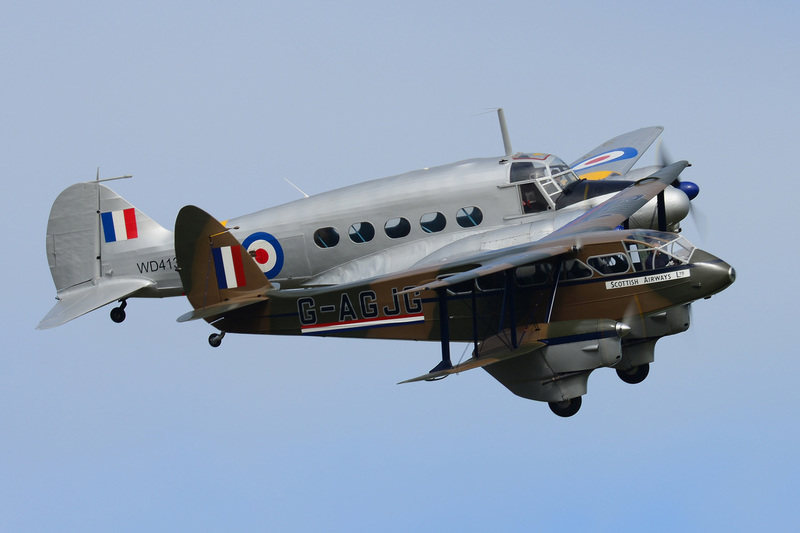 Flying in close formation with the Anson was de Havilland 89A Dragon Rapide G-AJGJ an aircraft type that has seen many roles within military and civilian guises. 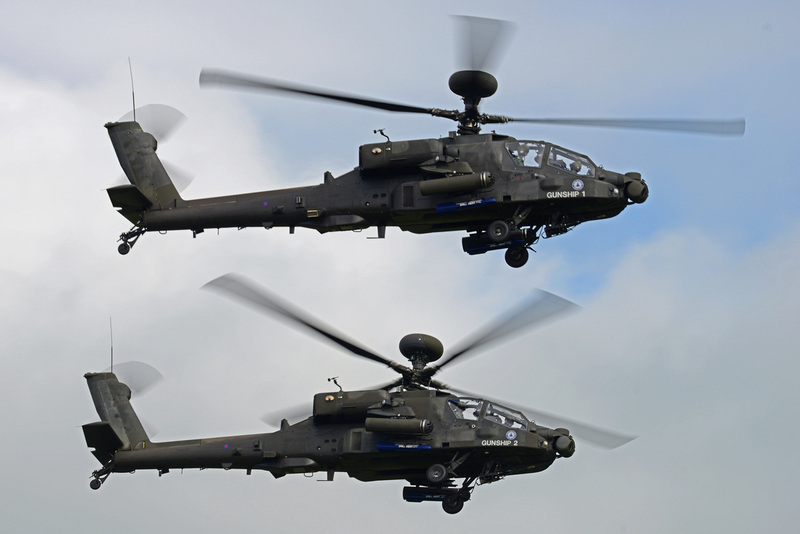 ​The UK’s modern army aviation was represented by two AgustaWestland Apache AH.1s from the Army Air Corps Attack Helicopter Display Team, who had flown in from 3 Regiment AAC Wattisham Flying Station. The two helicopters flew a simulated attack routine of the type used in Afghanistan and Libya. The show was now drawing to a close and the finale was to be a salute to VE and VJ Day. As celebrations were underway to mark VE Day in 1945, the war in the Pacific continued. Aircraft that took part in the Pacific theatre were represented by three American fighters provided by the Fighter Collection, the Grumman FM-2 Wildcat JV579, Vought FG-1D Corsair KD345 and Curtis P-40F Warhawk "Lees Hope". 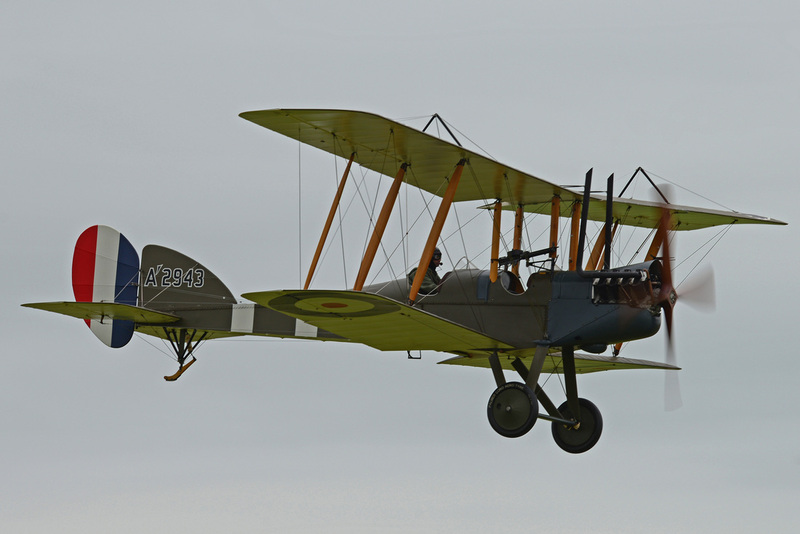 The aircraft arrived over the airfield in formation and then split up to carry out individual displays. 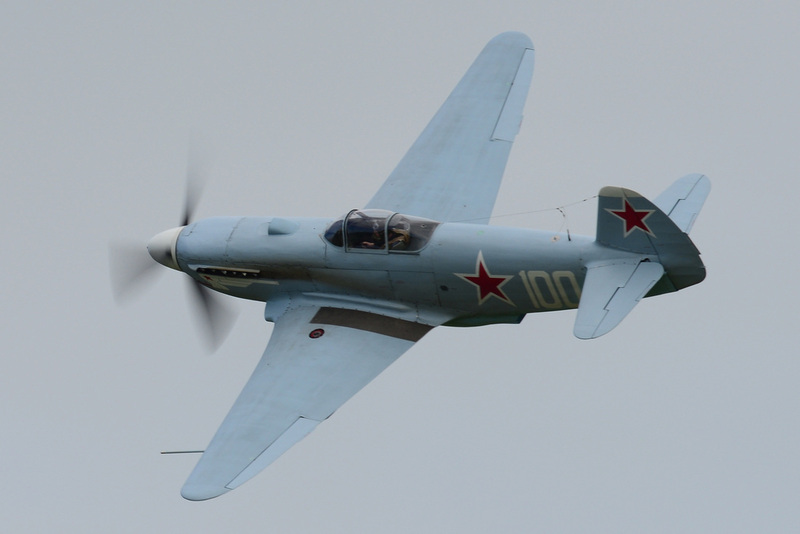 As the fighters undertook their routines more aircraft took to the skies to form up for the VE Day Salute. The Warhawk and Wildcat departed to join the formation whilst the Corsair performed a solo display until the VE Day formation was ready to run in. Leading the VE Day Salute was Boeing B-17G Flying Fortress Sally B, with the Wildcat, Warhawk and three North American P-51D Mustangs on each wing. 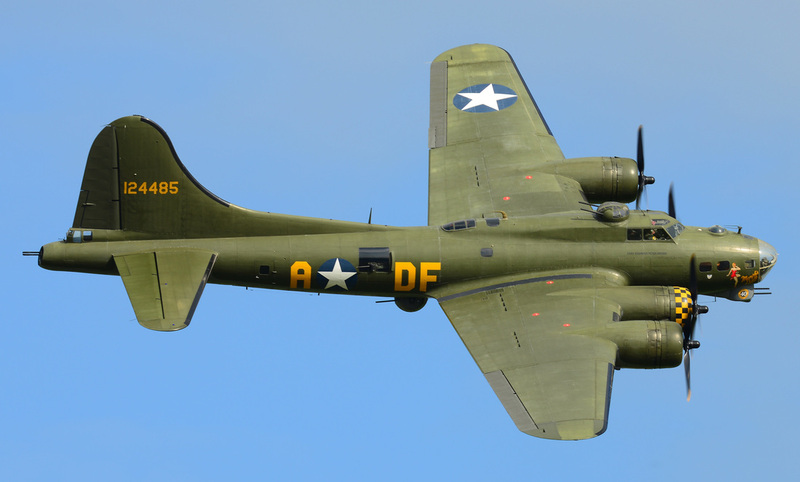 The year 2015 also marks the B-17’s 40th year on the UK airshow circuit, 40 years based at Duxford and 75 years since the aircraft rolled off Lockheed’s Vega production line. ​​Following on in a second formation was Plane Sailing's Catalina 433915, Aces High Douglas C-47A Skytrain 2100884 and Beech 18 G-BKGM. 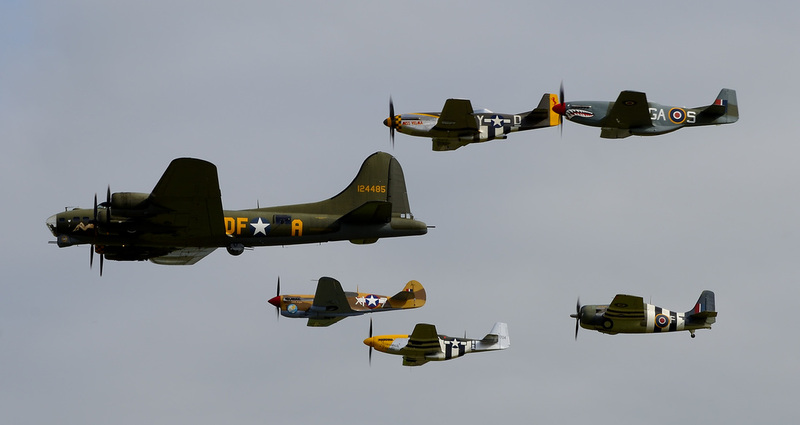 As the formations dispersed, The Fighter Collection's Mustang TF-51D Miss Velma, Norwegian Spitfire Foundation's P-51D KH774 & The Old Flying Machine Company's P-51D Ferocious Frankie undertook a very spirited tail chase. The show was closed by a solo display by Sally B which was very appropriate given the grievous losses suffered by the USAAF’s 8th Air Force in the European bombing campaign. The day ended under blue skies and with the satisfaction of a show well run. It was a shame that the BBMF's Lancaster could not participate due to an engine fire, but this just goes to show how lucky we are to have these classic aircraft still in the air after all these years.